Right on cue, after we made the call is was high time for the leading consulting firms to buy into BPO, KPMG makes its first major As-a-Service move, picking up Towers Watson's HR Service Delivery practice, which includes both technology implementation and HR process delivery capabilities. And this isn't some traditional HRO play, it's KPMG making a serious investment in Workday delivery across both HR and Finance & Accounting. KPMG already claims to be the transformative partner for 45% of the world's Workday financials rollouts... now it is playing with the leaders in Workday based HR delivery, namely OneSource Virtual, Deloitte, Accenture, Collaborative Solutions and Meteorix. 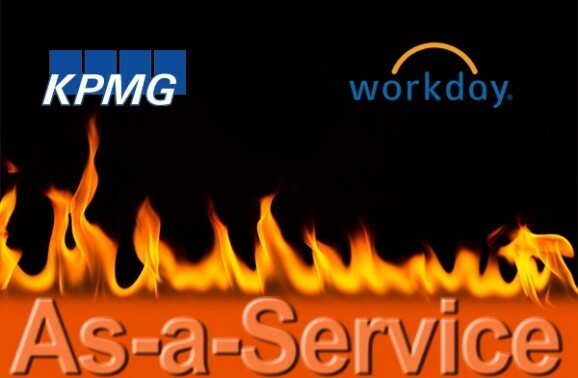 Does this mean KPMG is now an HR-as-a-Service Provider? Yes it does. The firm has realized it has to be in the managed services business to support the emerging SaaS offerings across technology implementation, post go-live support, transaction business processing and higher value services, such as organizational change management, workforce analytics and ad hoc strategy needs... in an on-demand model. It also knows it needs to be in the position to provide these on-demand capabilities around several core HR SaaS product suites, notably Workday, Oracle HCM and, ultimately, SAP Successfactors. So can KPMG lead the HR-as-a-Service market? KPMG can certainly compete against the consultative global leaders in HR, most notably Deloitte, Accenture, IBM and Mercer, while also having serious capabilities to spar with the emerging niche service providers, especially where clients have global requirements at scale. With this Towers Watson deal, HfS estimates an additional 150 Workday specialists are being added across United States, United Kingdom, China/Hong Kong, Canada, Singapore, and the Philippines to add to KPMG's current HR practice of ~600 practitioners across 18 major global countries. This is now a serious global player, which can pivot impressively across both finance and HR domains around the leading SaaS platforms. With this deal, KPMG also assumes ownership of both the famous Towers Watson HR Service Delivery and Technology Survey and Forum, which it can quickly absorb to enhance its own brand credentials and domain leadership in HR-as-a-Service. The Bottom-line: The ambitious consultants are moving into As-a-Service, so what are the next moves we can expect? Accenture never veered from being a service provider, in addition to a consultant, and now reaps the rewards for dovetailing the best of both worlds - managed services, global scale and scalable skill. Deloitte, KPMG and PwC have claimed, for the last two decades, to be consultants and audit firms - and not managed services providers (even though Deloitte has always had a few discrete offerings that smell a lot like managed services). Now, KPMG is moving into As-a-Service delivery, with a particular Workday flavor that is clearly the best starting place with the level of global demand for this offering. The next move will surely be it continuing to build a Finance-as-a-Service capability around the emerging Workday financials management suite that is attracting major interest from CIOs and CFOs. Accenture and Deloitte will be nervously watching this move, not to mention several traditional HR service providers, such as AONHewitt and NGA, which are trying to figure out where (or whether) they truly belong in this As-a-Service business. Accenture has done an impressive job honing its HR-as-a-Service delivery around Workday and SAP Successfactors (among other SaaS offerings), while Deloitte is still clearly stalling on whether or not it is in the As-a-Service HR business, versus merely being a consultant - and may now be thinking that KPMG is stealing its thunder in the space. Meanwhile, we have a whole host of feisty new-generation As-a-Service providers, such as Aason, OneSource Virtual, Meteorix and Appirio, which are unraveling their gameplans to stay ahead of this evolving space. Some questions too, if relevant, also building forward from the past discussion - Why did Towers Watson sell? Will KPMG go the full cycle to also offer HR-BPO-transactional bits around this for clients that use their services for Workday, as the lines blur? Where are the traditional BPO players in their endeavor to move up the chain? Don't hear Genpact anywhere in the Workday players? or are they secure as independent players? HR/O has attracted a bunch of PE/VCs, traditional boutiques and full service players for a while now and it was touted as the next space to watch in the last decade. But since the big bad deals landed by IBM, PWC, CVG/NGA et al. a longtime ago, why has HR never realized its promise for service providers? Perhaps its time has come? A very informative post. How do you feel the likes of a KPMG can still justify its top-end consulting margins when it comes to SaaS delivery? Isn't the whole point of SaaS to get away from costly transformation issues? A bolt from the blue, Phil, this one! You did call it too - these guys need to find their place with As-a-Service of get left on the side of the road. Insightful, as always. Where does this leave Towers Watson, and why did they sell off this practice, Phil? ...and continually innovating as one feeds off/complements the other (process consulting and BPO). Thanks Phil, good vision for BPO 2.0 !! I'm a little perplexed by your characterization of this deal as a BPO move. The way I understand it KPMG is buying TW's Workday implementation business, along with some functional service delivery model design expertise, not getting into managed HR services. When you say BPO I think of firms like AonHewitt, Xerox, Northgate Arinso that deliver services such as payroll, ben admin, HRMS admin, etc., etc. Are you saying something different? I see this deal being more similar to Deloitte acquiring Aggressor or Aon buying OmniPoint or Kloud. What am I missing?